At Carrington Court we strive to give you choice. Many manufacturers and retailers offer a very limited selection of fabrics. This allows them to keep costs low through volume buying. Of course the downside of this is that you only have 5 or 10 selections to pick from. 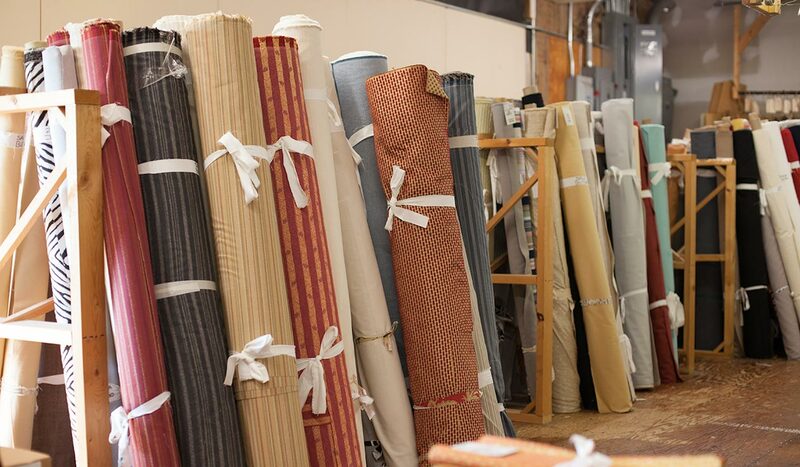 We know that not everyone has the same taste or decor, so we offer 100 fabrics to choose from. With this many fabrics almost anyone can find a fabric that suits his or her needs. And if you can't? We have a customers own material (COM) program that allows you to send fabric to have chairs upholstered in. We try to keep a wide range of colors, patterns and textures. Our fabric line is weighted toward neutral colors that will work in just about any area of the house. We then add selections of various patterns, prints and textures. Our selection is constantly changing based on customer demand, analysis of customers own material orders, season and latest fashion and color trends. Is the parsons chair going to be used heavily? Do you have pets or small children? Is the chair going to be used for dining? Are your chairs going to be the centerpiece of the room or an accent? Is the room extravagant or simple? For example, a room with floral wallpaper, lots of pictures, mirrors and many other decorations may not be right for a print. A print may make the room look too "busy." On the other hand, if your room is plain with neutral colors and little in the way of decoration a print may liven up the area. Do you repaint or redecorate often? If so, a neutral color may be your best option. Do you think the fabric will still be appealing to you in several years? Most everything we select has durability in mind. However, different materials work better in certain situations. Below is a list of common material used in many fabrics offered by Carrington Court. If you order swatches, the contents will be listed on the swatch back. Cotton - This is a natural fiber that provides good resistance to wear, fading and piling. It offers less resistance to soiling, but the is often atoned for by blending with other fabrics. Acrylic - A synthetic fabric that was originally developed as a wool imitation. It resists wear, wrinkling, soiling and fading. Nylon - One of the most resilient fabrics. Nylon is rarely used alone. It is often blended with other fibers, making it one of the strongest upholstery fabrics. It doesn't readily soil or fade. Olefin - This is a perfect choice for furniture that will face heavy wear. It has no pronounced weaknesses and is often used in blends with other fibers. Polyester - Rarely used alone. It is often blended with other fibers to offer wrinkle resistance. Rayon - This fabric was developed as a silk alternative. The fabric is more durable than silk, but can wrinkle. Recent advances in Rayon development have made it a very practical fabric or blend. Every fabric offered on our parsons and dining chairs has been thoroughly tested by the manufacturer. Many of the fabrics that we pick go through rigorous "real life" testing. Our employees are the testers. We often send home chairs in new fabrics to be tested in the homes of our employees to see how the hold up in the real world. The fabrics are treated to the same conditions you may face in your home: food, liquids, children and pets among other things. After several months of use we get a report back on how it is holding up. It usually doesn't take very long for fabrics that are not practical to show up. In one situation an employee had chairs upholstered in a dark chenille fabric. The fabric was one of the most popular offerings from the manufacturer and was gorgeous to look at. Our employee reported a few weeks later that the fabric would not work for her. The reason: 3 cats. The design of the fabric would catch just about anything that came into contact with it. It ended up working like a giant lint brush catching cat hair, lint and dust. We dropped several colors of the fabric immediately. There was no question about the durability or style. It just turned out not be very practical in every day use. Conversely, this same testing has turned up some real winners. One such fabric was ultrasuede, a synthetic fabric that looks identical to real suede. There were many reports of its durability. Liquid beaded and rolled off. Jelly, syrup and pasta sauce came off with water and there were no stains. Pet hair was easy to remove and the fabric aged very well. These results encouraged us to add several new colors to our line. Not every fabric is easy to clean. We try our best to get fabrics that are easy to maintain, but there are tradeoffs in cleanability for some styles and colors. If you have ordered swatches you may have noticed the cleaning code on the back. A detailed explanation of cleaning codes can be found here. In an effort to better resist stains, we offer a Stainsafe program. This program combines a 5-year stain warranty with a Scotchgard treatment to help resist most stains. This gives you the ability to have confidence in ordering just about any fabric that we offer and is only $15 per chair. Remember, no fabric is stain proof, but if you select the correct one for your environment it should last a long time.